Beth Humberd, Ph.D., is an expert on issues of worker identity, gender & diversity, relational dynamics in organizations, and the changing nature of work. Her current research streams examine how individuals experience their work and non-work identities amidst broader societal and organizational shifts, as well as how social dynamics in organizations shape important individual and organizational outcomes. Dr. Humberd’s work has been published in top academic journals such as Academy of Management Review, Academy of Management Perspectives, and MIT Sloan Management Review, and has been featured in many popular press outlets, such as the New York Times, Time Magazine, and the Wall Street Journal. 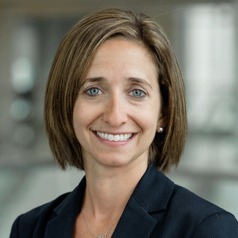 She began her professional career in the financial advisory services consulting practice at PricewaterhouseCoopers, and then spent six years working in a variety of corporate finance roles at Boston Scientific Corporation. She left industry to pursue academic interests, receiving her Ph.D. in Organization Studies from the Carroll School of Management at Boston College in 2014. She is currently a professor in the management department of the Manning School of Business at UMass Lowell where she teaches organizational behavior to undergraduates and graduate students.